Data can be used to reveal new insights and lead to the prevention – or even eradication – of urban health problems. Data analysis and visualizations play an important role in assessing the health of a city. It is a source of information that leads to action. By combining different data sources and applying econometric analyses, we can harness real world data to support the implementation of technological and service innovations in health. After working with many institutions and clients on various health related projects, we have identified the available data sources, both public and private. We have deployed this data to great effect, turning complex data into interactive visualizations that provide a way to identify potential (health) issues, develop hypotheses to be tested further, support multi-disciplinary approaches and policy decisions. Looking at data from a geographical perspective can reveal new insights and lead to the prevention or eradication of diseases. Just one example of how ahti uses the power of visualizations is our work around the mapping of trends in HIV. By supporting Amsterdam’s H-TEAM in planning interventions, we can help to prevent new infections and prioritize areas for testing. You can ask better questions and spot more intriguing opportunities with real world data at your fingertips. We offer our capabilities to healthcare professionals, entrepreneurs and policy makers alike, to help them identify the right priorities and design effective interventions to match. We pull in data for you from a wide range of sources and turn them into tailor-made data visualizations, providing you with a platform to maximize the real world impact of your innovation or health intervention. 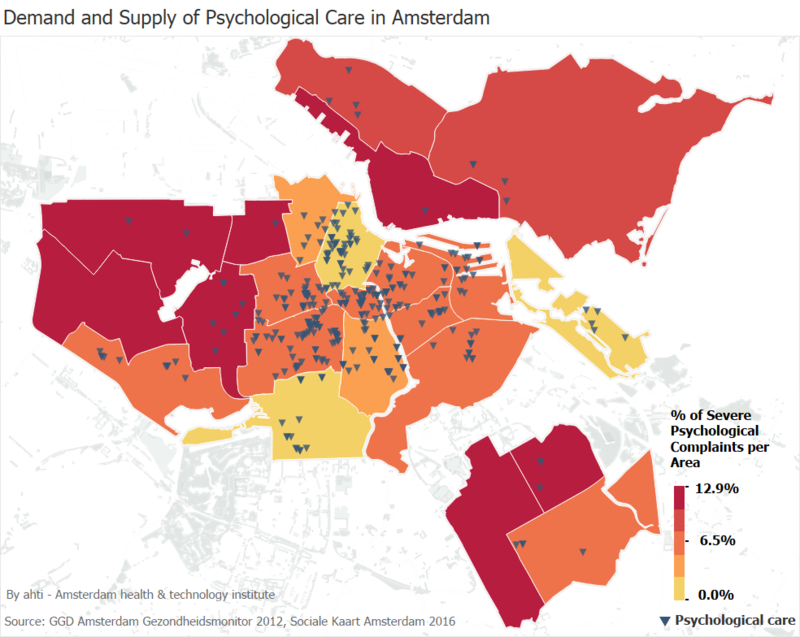 This visualization depicts the percentage of people with serious mental health problems across Amsterdam, as opposed to the locations where psychologists are.The three darkest areas are the three pockets of problems. The providers are hardly located here, they are in the center of town (the light blue zone). We have more detailed information on a lower level but do not show them for reasons of privacy. Figure 2. Still more than one thousand people in the Netherlands get infected with HIV every year. The map above shows the actual HIV prevalence* across Amsterdam where around 5,400 people are diagnosed with the virus. The darker the neighborhood, the higher the percentage of HIV positive people living there. We see that the epidemic is clearly concentrated in a few neighborhoods of Amsterdam**. Identifying high-risk areas in the City can help in preventing further infections among the entire population. * People with HIV who are in care as of May 2016. In care is defined as a last visit or other contact in 2015 or 2016 and still alive and not migrated out of the Netherlands. Areas with less than 5 observations are removed for privacy reasons. ** The high percentage in the District Zuidoost (Southeast) is mostly due to a relatively low number of inhabitants in that area.